There are times when I cook that I like to pack in every vegetable and also the kitchen sink. And then there are nights when I just crave something simple. This is the latter, obviously, and it’ll take you only ten minutes to make. 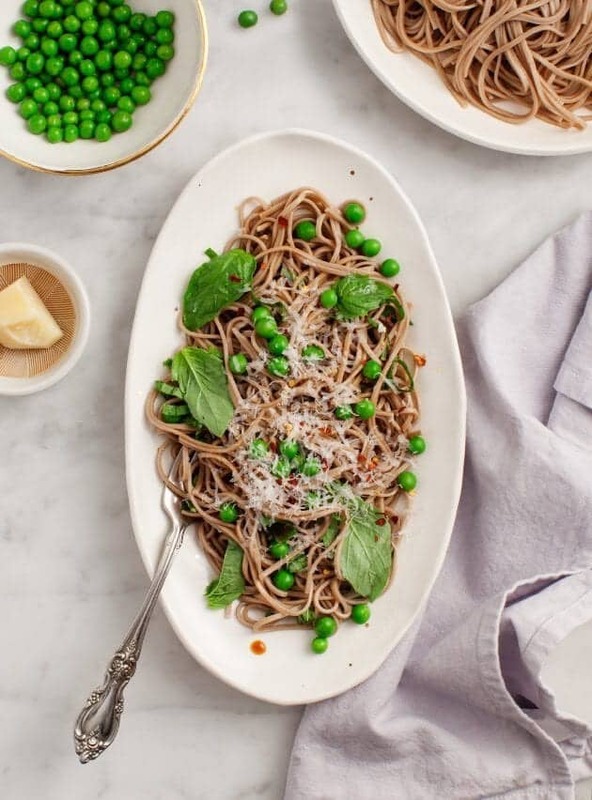 The ingredient combo here is a little strange, but hear me out – soba noodles, sesame oil and good parmesan cheese all have a delicious nutty flavor in common. Basil and fresh peas are sweet which offer a nice simple balance. 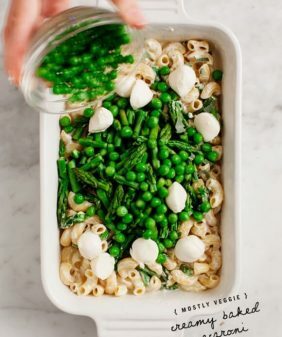 I love the subtle flavor of fresh peas here, if you don’t have any, just skip them in lieu of using frozen peas. 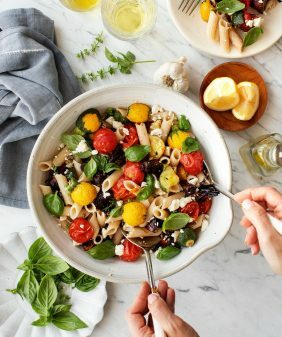 And since there are only a few ingredients here, they need to be good ones – good cheese, fresh basil, good sesame oil, and good noodles. 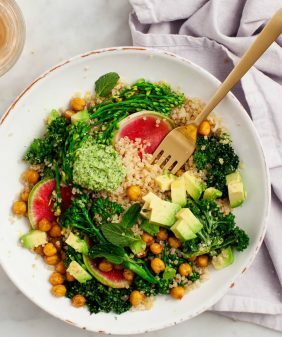 I made this for dinner along with some salmon, but if you want to add more veggie protein here – go for it – add some edamame or baked tofu. Save the leftovers for lunch the next day! Cook the soba noodles according to the package directions (usually around 6-9 minutes). When they're done cooking, scoop out the soba noodles, leaving the water boiling for your peas. Drain the noodles and lightly rinse them. Place them in a large bowl and toss with the sesame oil. Set aside. Prepare a bowl of ice water and place it near your boiling pot of water. Boil the peas for about 1 minute, then drain and place into the ice water. Drain them well, then toss them into the bowl with the noodles. To your bowl, add tamari, basil, cheese, red pepper flakes and freshly ground black pepper. Toss and add more tamari to taste, squeezes of lemon and another grating of cheese. This is a great side dish for fish (sesame crusted tuna or salmon). 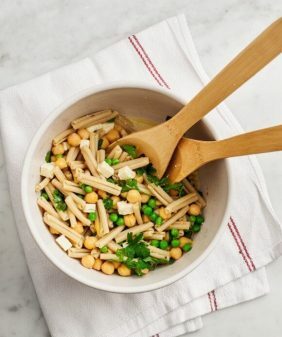 To add veggie protein: use edamame instead of peas, or baked tofu. To make this gluten free, use 100% buckwheat soba noodles or brown rice noodles. My favorite brand right now is King Soba because the texture of their noodles is perfect. Also, be sure to use tamari and not soy sauce. 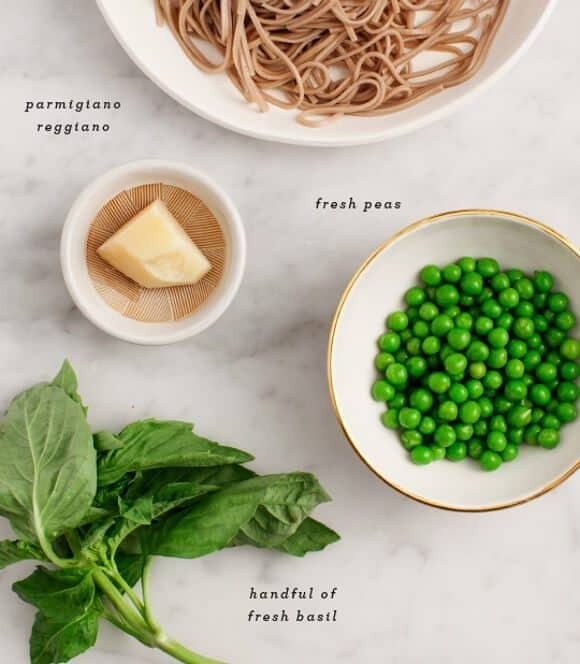 This site + noodles + basil = always a good recipe. Love it! I love a good soba noodle bowl! This looks fabulous! YUM! I love the idea of Soba in the summer. Saving this for later! your meals always look so light and refreshing. 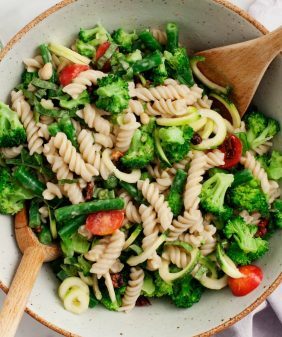 I love a simple summer pasta salad and the soba noodles sound wonderful in this! Soba noodle or black rice noodle bowls are something I make when I need simple but good. 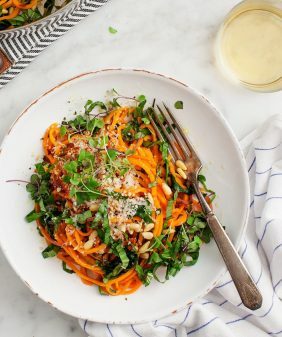 These are the sort of pasta meals that really hit the spot on busy weeknights and I like the sweet/nutty pairing here. YUM. This looks delicious! Definitely will giving this recipe a try. 🙂 Also, love the bright colors of the presentation! I just made this – it’s SO good! We did a mix of peas and edamame and ate it cold with toasted sesame seeds on top. I’m constantly sending recipes from your blog around and never wind up making them – simple, fresh and delicious. I will be eating my way through your website today onwards. Cheers!